Amy Butler, an American designer specializing in fabric designs and patterns, shares a common passion with Welspun to offer eco-friendly, sustainable fibers with vibrantly layered designs and colors. Amy's artwork is inspired by nature, gardens, travel and everyday life, and she designs with bright, energetic colors that bring creative flair to the modern Nest. Royal blue Hydrangeas dance through your dreams as you sleep comfortably in this organic cotton bedding ensemble. The small-scale blue floral reverse keeps you cozy through the night. This bedding collection features 5 different fabrics that are used throughout the entire Kyoto collection. This bedding collection features 5 different fabrics that are used throughout the entire Kyoto collection. 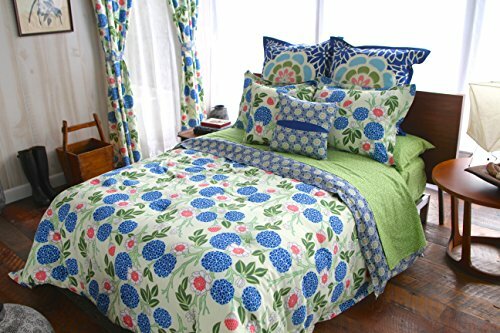 • set includes 1 duvet cover and 2 shams (1 sham in twin set) • printed on 300 thread count organic cotton • machine washable • duvet cover available in 3 sizes: - twin/twin XL : 1 duvet cover (66"x86" with a 1.5" flange and invisible zipper closure) - full/Queen : 1 duvet cover (90"x92" with a 1.5" flange and invisible zipper closure) - king : 1 duvet cover (104"x94" with a 1.5" flange) • coordinating euro shams, decorative pillows, sheet set, and window accessories also available • made in India. If you have any questions about this product by Welspun, contact us by completing and submitting the form below. If you are looking for a specif part number, please include it with your message.